You all know that eating fresh picked fruits and veggies is way more delicious than biting into ones that are bought at the grocery store. Yes, farmer’s markets can be fun to go to for this type of flavorful experience, but to get even more enjoyment out of your fresh food with far more convenience, you can grow your own produce in your backyard. 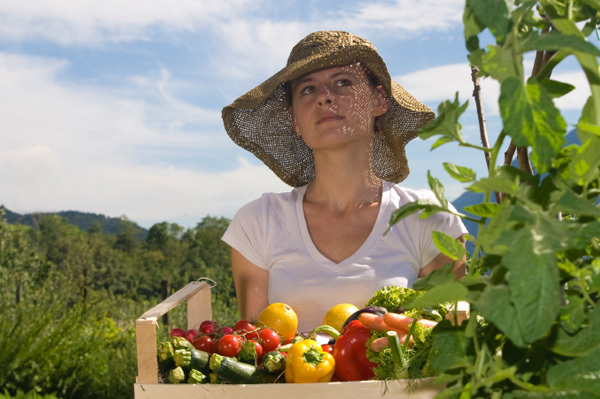 Not only is growing your own food convenient, it is also environmentally conscious. Best of all, according to Natural Health magazine, you don’t even need experience to start your own summer garden. Produce fresh off the vine contains the highest levels of vitamins, nutrients and antioxidants. In addition, growing your own food eliminates the use of unnatural pesticides and fertilizers and cuts down on harmful carbon emissions. Choose produce you like and then add some you are less familiar with. The latter will help you expand your creativity in the kitchen and with your recipes. Some easy to grow foods include, radishes, strawberries, tomatoes, peppers, zucchini, basil and arugula. Once you’ve decided what to plant in your garden, you should make sure you have enough space for your plants. Smaller foods like radishes only need about ten inches to grow, while tomatoes and potatoes may need up to twenty-five inches. Since seed quality affects how your food will taste, you need to be aware of which seeds to buy. Natural Health advises that hybrids (bred for thicker skin or more uniform fruits) are easier to grow, but may not be as flavorful as naturally occurring heirlooms. They also say to plant only traditional and heirloom seed varieties from companies that preserve them in order to protect threatened species. And if you want to go organic, then it’s suggested you buy seeds that haven’t been treated with chemical insecticides and fungicides. Read the labels or ask at the store for guidance. You should also be aware of the difference between seeds and seedlings. Seedlings, which have already sprouted leaves, will produce food quicker than seeds. However, some plants such as beans, squash and cucumbers are best planted from seeds, instead of transplanting them to your garden. You should also check the date on the packet, as many seeds won’t germinate if they are more than a year old. The best time to fertilize your garden depends on the individual plant. As some require fertilizer when first planted and others need it as they grow, you should research the plants you put in your garden to determine a schedule. The best time to water is early in the day and then again at night. Avoid watering your plants midday, as this will often leave brown spots on your plants. It’s said that you don’t need experience or even a lot of tools to start your very own garden. According to Natural Health, all you need is a sunny windowsill or a small space on your balcony or in your yard. As for tools, all that’s required is a small trowel and a basic organic fertilizer. They suggest All Purpose Fertilizer from Gardener’s Supply Company. If you’re growing indoors or in containers outdoors, you can buy pots for your plants or use deep containers like a bucket, serving bowl or colander that has holes for drainage. Make sure to fill them up with organic potting soil, as this drains much better than dirt imported from your yard. Once you’ve got all your tools, plants and seeds, all you need is a little elbow grease!